At a very general level the question cannot be answered. It depends on specific circumstances and specific proposals. In this case study I am going to concentrate on the work of Hélio Oiticica (1938–1980) and some of the questions it raises that are pertinent to the discussion of replicas and replication. I want right away to acknowledge the help I have received from Luciano Figueiredo, artist and Director of the Centro Cultural Hélio Oiticica in Rio de Janeiro. As one of the original group of ‘Friends of Hélio Oiticica’ who assembled after his death in 1980 to care for his work and legacy, and which included his two brothers Claudio and Cesar who inherited his estate, Luciano has been close to all decisions taken regarding making replicas of Oiticica’s existing works or objects, and constructing works from the artist’s notes and plans. I am equally grateful to Luciano’s sister Ariane, who looks after the archive of the Projeto HO, the estate collection of work and documentation which is housed in the family house in Jardim Botanico, Rio de Janeiro, which has been converted into a store and study centre for Hélio’s work by his architect brother Cesar. Ariane actually made the replicas of Hélio’s Parangolé Capes which have ‘stood in’ for some of the originals – now in precarious condition – in exhibitions of Hélio’s work, which has permitted the public to wear and explore them. I will be drawing on emails Luciano and Ariane have sent me recently. The question of replication, reproduction and re-creation becomes particularly poignant in relation to Oiticica because he himself was very concerned with the life and afterlife of his works. Not only the existence they might have posthumously but how they would continue to live, retain their vitality and efficacy during his lifetime. Certain later works are devices designed to rescue, in a sense, an earlier concept, or what he would probably call a ‘life-act’, from appropriation and acculturation by the art institution and art market. A clear example is the Counter-Bolide: To Return Earth to the Earth, enacted in 1978, two years before his death. ‘Counter’ in the sense of reversal of the original Bolides in which a material – earth, pigment, and so on – was withdrawn from the world into a container to become an energy-centre or Fireball, as the Portuguese word denotes. The Counter-Bolide was part of an event he organised on a site in Rio’s Caju, a forlorn lot and rubbish dump near the port in what used to be the Portuguese imperial quarter. Rich black earth was brought from another place and poured within a small rectangular enclosure: when the wood frame was removed the earth stayed on the earth. It was a kind of burial of the Bolide as an object and its rebirth as an ‘act’: a renewal in fact of its original intention to make ‘manifest the presence of some earth as a piece of the earth’. Another example is the Made-on-the-Body Parangolé participatory events, undertaken on several occasions in different cities and countries. Out of a plain three-metre length of fabric of bright colour ‘each person must build on the body a structure, uniting the edges and extremes with safety pins’. Oiticica stressed that each cape should be removable without disturbing the pins, so that it can be handed on to someone else, who will ‘wear’ it and activate it in a different way. He emphasised the desirability of participation by a heterogeneous public. Recently, a set of Capes surviving from the Made-on-the-Body event at Recife in 1979 – capes improvised by participants on their own bodies and those of others – were shown like chi-chi fashion items on specially designed hangers in a commercial gallery in São Paulo. I can imagine his total freak-out at such a development. However, in a practical sense, Oiticica did allow for reconstruction or replication of certain works during his lifetime. In 1968 I accidentally broke his Glass Bolide 14 ‘Estar’ (‘To Be’) which I had in my flat at a time when I was searching for possibilities of exhibiting Oiticica’s work in London. Estar consisted of a loose mass of sea-shells in a glass container. Oiticica sent me detailed instructions of how to cut the top off a type of large glass flask, smooth the edges and transfer the shells to the new container. In England, we were not able to find the same flask he had used in Brazil and my memory is hazy as to whether we substituted an available bottle or not. Nevertheless, his letter shows he wanted to reconstruct the work. It was eventually posthumously remade in Rotterdam for the 1992 exhibition, but was never exactly the same as the original. The first replicas to be made were in 1985, when we (myself, Lygia Pape, Mauricio Cyrne, Thomas Valentin and other members of the Advisory Board for Projeto HO) were asked to lend works by Hélio for an exhibition organised by the Brazilian art critic Frederico Moraes called Opinião 65. The exhibition was an attempt to revive the historical show of the same name that had taken place in Museum of Modern Art in Rio in 1965. It was precisely in this show that Hélio had made the first public presentation of his Parangolés. I personally made the research of fabrics and other materials and I painted myself the parts that were to be hand-painted and I recall that we presented the two or three replicas in the street outside the art gallery at Copacabana beach with live music playing. We considered the presentation very effective and this was how the posthumous existence of these works began. In 1986 we made the first reconstruction of Tropicália to be presented in an event in São Paulo. This reconstruction involved a special problem because either Hélio did not design a drawing-plan for the construction or the drawings had been lost. So, the re-assembling of panels that make the cabins was done by studying all the photographic material in the archives: photos of the first installation of 1967 at MAM – Rio de Janeiro, photos from publications and photos from the Whitechapel exhibition. Other materials and aspects of Tropicália were found in Hélio’s texts and also in his letters. In the same year (1986) we organised in São Paulo an exhibition including many of Hélio’s works (Bilateral, Spatial Relief, Bolide, Parangolé and Tropicália). This show took place at Galeria São Paulo and it drew very strong attention from the public, the artists, art critics and the Brazilian press. It was the first major presentation of Hélio’s works in Brazil since the late 1960s and again we made replicas of Parangolés, that were worn by the public in a very satisfactory way. We also supervised the making of one replica of a Spatial Relief and an edition of approximately 150 copies of the banner ‘Be a Marginal Be a Hero’ was made, based on an original copy made and signed by Hélio. This exhibition marked the beginning of a new discussion about Hélio’s work in Brazil. 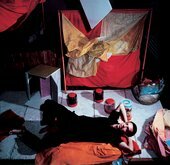 Oiticica used a great variety of fabrics, plastics, canvases, sponges, straw, charcoal, nylon mesh and bags which are no longer available. Looking for the right material involves much research and long walks not always rewarding. At times I could find the right material but with a different colour or the right colour but the material is not the same, so a question always challenged me: should I be more faithful to the colour or to the texture, as in the case of the works of Hélio Oiticica both values are extremely important? I suppose this conflict will always exist and maybe there will never be an answer to it. But, without the copies, how could we show today and in the future a work that is sensorial by its nature and that demands the participation of the spectator? Works actually constructed for the first time from plans, notes and drawings left by Hélio, carried out or supervised by Luciano for the Projeto include two of the Cosmococa installations (New York, 1973; construction 1991); and the Penetrable Invention of Light, 1978–80, which existed as a small maquette (indeed, Hélio referred to it as a ‘transformable maquette-work’), consisting of five translucent screens set in sockets in an earthen or crushed brick ground, which could be moved or removed in ‘strong light (not very close to the pieces) for light effects’. For the 1992 retrospective this was enlarged to a scale where people could walk into it and, with some difficulty, move the screens. The last reconstructions or replications Luciano made were of the Penetrable Nas Quebradas, originally of 1979. There was one reconstruction in 2002 and another in 2003. The original work had been destroyed while Oiticica was still alive. For this reconstruction Luciano used the artist’s original drawing plans, which included a detailed list of all materials, and photographs of his original installation. The construction of the Cosmococa series is a special case because the plans were elaborated together with Oiticica’s friend, the filmmaker Neville d’Almeida, in New York, and Neville has quite naturally interpreted them in the light of his own experiences and memories. In the case of the Invention of Light, I felt the simple enlargement of a maquette did not work well. I felt sure Oiticica would have carefully considered the problem of scale and made changes (his title ‘maquette-work’ seems to establish this). But such judgements are inevitably subjective. The reconstruction of Nas Quebradas was criticised by some people who remembered the original (which I never saw) but I liked the piece and, in fact, was deeply moved by it. I saw it in the same lineage as the Grand Nucleus (early 1960s): a strange meeting of the lucidity and compression of abstraction with the lived experience of the hillside favela. Having had the experience of studying and handling the works of Hélio Oiticica for so long and by showing his works in many museums in Brazil and abroad, I must confess that after all these occasions and giving thoughts today to these matters, I think that the making of replicas or reconstruction of works can be more complex in the case of some artists than others. I think that due to the originality of each artist, the values, qualities and problems varies from one to the other and each artist can provoke a different point of view of what is in question. When I participated in and encouraged the decisions about making replicas of works of Hélio Oiticica, I did so under the belief that the role of the replica would effectively contain the meaning of the original work. It was always clear to me that a duplication of Parangolé, for example, when faithful to the original can offer to the public the essence of the original piece. However, if I have today disappointment and criticism to express about some aspects of showing Parangolés (either originals or replicas) in the spaces of institutions, how could these works be part of the discussions of contemporary art if it was not by its presence made possible by replicas? Would it be possible to experience what is a Parangolé just by looking at documents and photographs or by looking at motionless originals as in a museum of costumes? Guy Brett, ‘Hélio Oiticica’, in Tate Papers, no.8, Autumn 2007, https://www.tate.org.uk/research/publications/tate-papers/08/helio-oiticica, accessed 25 April 2019.